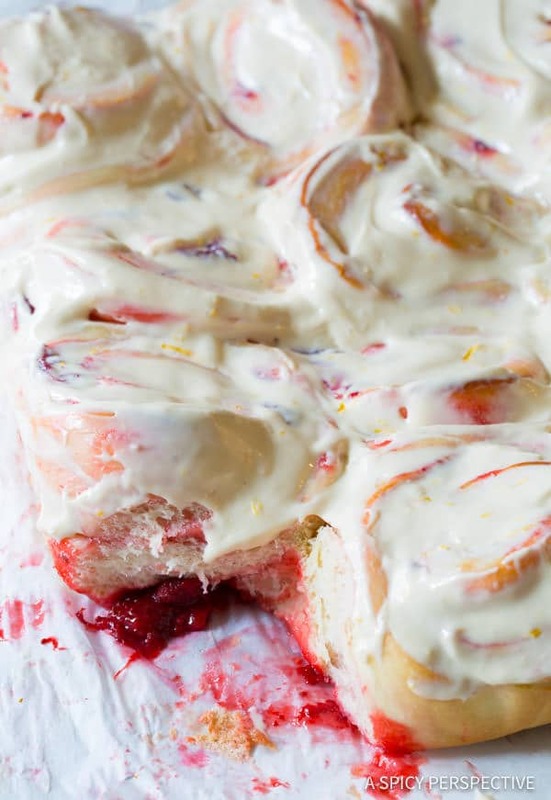 Sweet and tangy Strawberry Sweet Rolls with Lemon Cream Cheese Glaze. A vibrant treat to usher in spring! In just a couple months, fresh juicy strawberries will be in season. However right now, the berries I find at the grocery store are oddly shaped, discolored, and somewhat pathetic. That hasn’t stopped me from making all my favorite strawberry recipes. I simply make the most of what’s available right now… frozen strawberries, strawberry jam, and even good-quality strawberry pie filling. 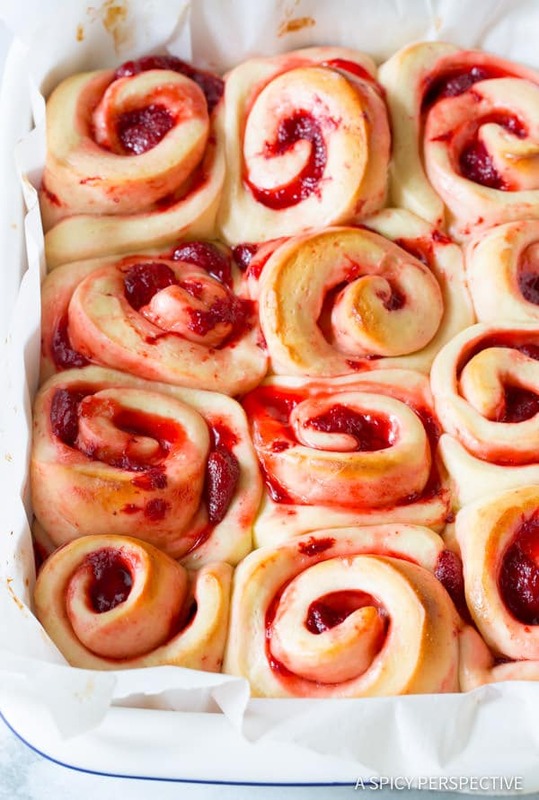 Today’s Strawberry Sweet Rolls Recipe is a perfect example of late-spring cravings, in winter weather. 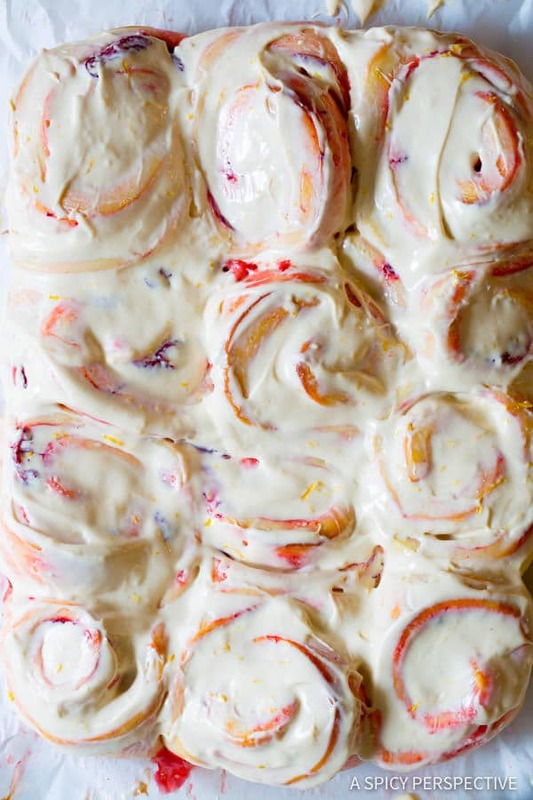 Normally I would make any fruit sweet roll recipe with fresh fruit. Yet I was craving Strawberry Sweet Rolls so badly, and the grocery store berries looked so pitiful, I decided to give canned pie filling a try. You know what? They turned out even better than I had hoped. The strawberry pie filling created a rich berry color and flavor without having to slice all those fresh berries. If you buy “premium” whole berry pie filling, you will still have nice big juicy berries tucked between the folds of the rolls. To top these pillowy sweet rolls, I make a quick lemon cream cheese glaze. The moment the rolls come out of the oven, shmear the glaze over the tops so it can ooze down between the layers. 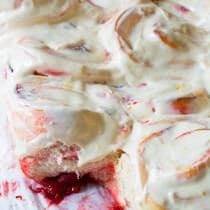 From here on, I’ll be making Strawberry Sweet Rolls with strawberry pie filling from September through April. Then I’ll go back to making fresh strawberry rolls from May through August. I’ve provided instructions for both in the recipe. 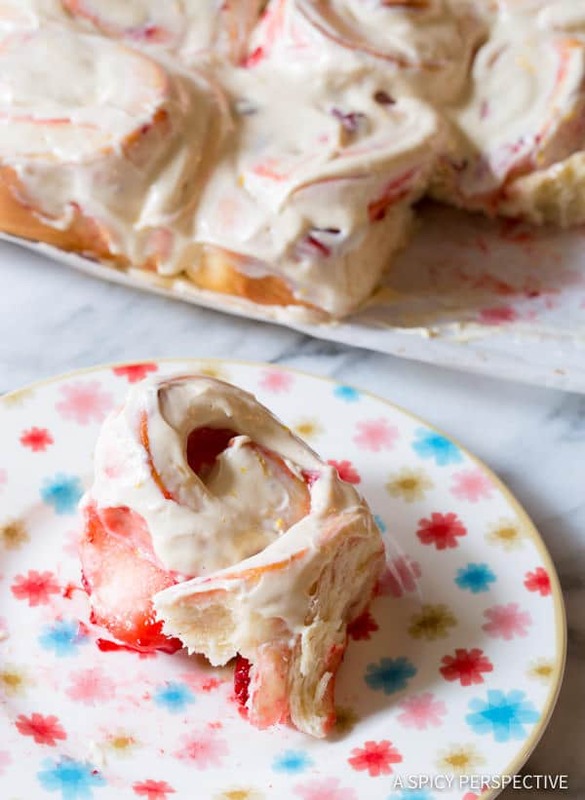 I like to serve Strawberry Sweet Rolls as a weekend breakfast, or as a special afternoon snack. There’s no greater reward than watching the kids’ faces when they walk into the kitchen and spy a fresh hot pan of strawberry sweet rolls resting on the counter. Sparkling eyes, big smiles, and lots and lots of hugs! 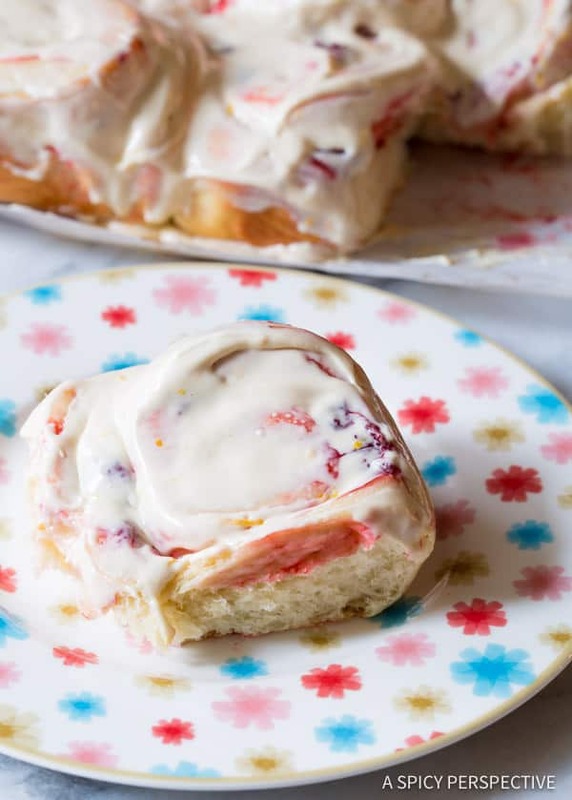 Moist and sticky Strawberry Sweet Rolls Recipe, made with tender homemade dough, strawberry filling, and lemon cream cheese glaze. Place the bread hook on the mixer and turn on low. Add the eggs, salt, and remaining flour up to 4 cups. Allow the mixer to “knead” the dough until it pulls away from the sides. Run the mixer for approximately 10 minutes to allow the dough to stretch and develop the gluten. If the dough seems too sticky after the first 2-3 minutes add an additional 1/4 cup flour. After 10 minutes, turn the mixer off. Cover the top with plastic, and allow the dough to rise until double in size, approximately 60-90 minutes in a warm kitchen. Dump the inflated dough out on a well-floured work surface. Fold into thirds and press flat. Then turn and fold into thirds again and press into a rectangle. Roll the rectangle out into a large 12 X 20 inch sheet. 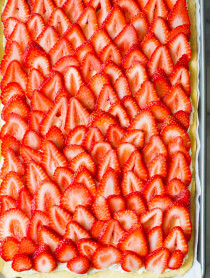 Using a large flat spreader, spread the strawberry pie filling (or fresh strawberries) over the sheet into a thin layer. Leave 1 1/2 inches bare on one long edge. Be careful not to gouge holes in the dough. Starting at the covered long edge, roll the dough sheet tightly toward the uncovered edge to form a long tight log. 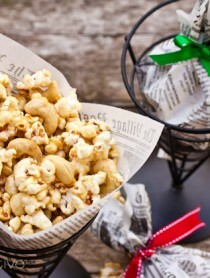 Place a piece of parchment paper in a 9 X 13 inch baking dish. Then cut the log into 12 equal rolls, and place them in the baking dish to rise. This is a messy process. 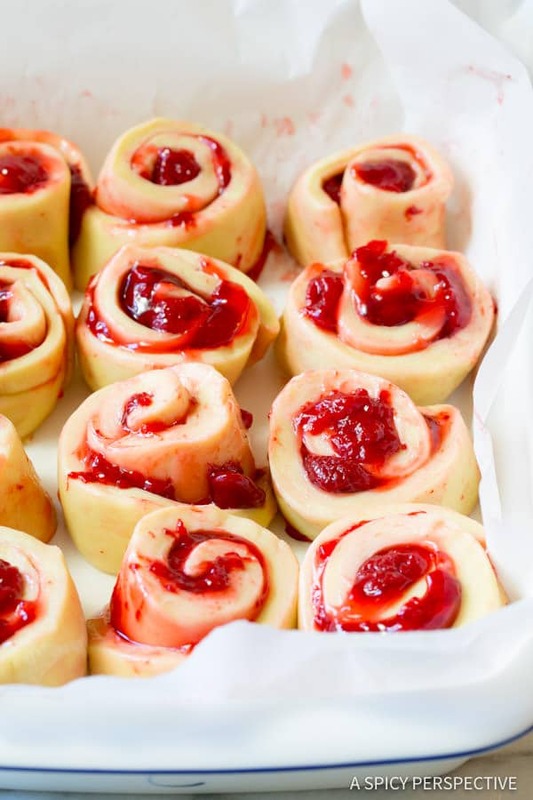 If strawberries fall out, just tuck them back in the rolls once cut. Preheat the oven to 350 degrees F. Allow the rolls to rise for at least 30 minutes while the oven heats. Then bake for 20-25 minutes, until the edges are barely golden and the centers of each roll are puffed up. For the Lemon Cream Cheese Glaze: While the rolls are in the oven, beat the cream cheese, butter, powdered sugar, vanilla and lemon zest together until completely smooth. The moment the rolls come out of the oven, gently spread the glaze over the tops and allow it to seep down into the cracks. Serve warm or at room temperature. NOTES: This recipe can be made with fresh strawberries when in season. Instead of pie filling, mix 2 cups sliced strawberries, with 1/2 cup sugar and 2 tablespoons cornstarch. 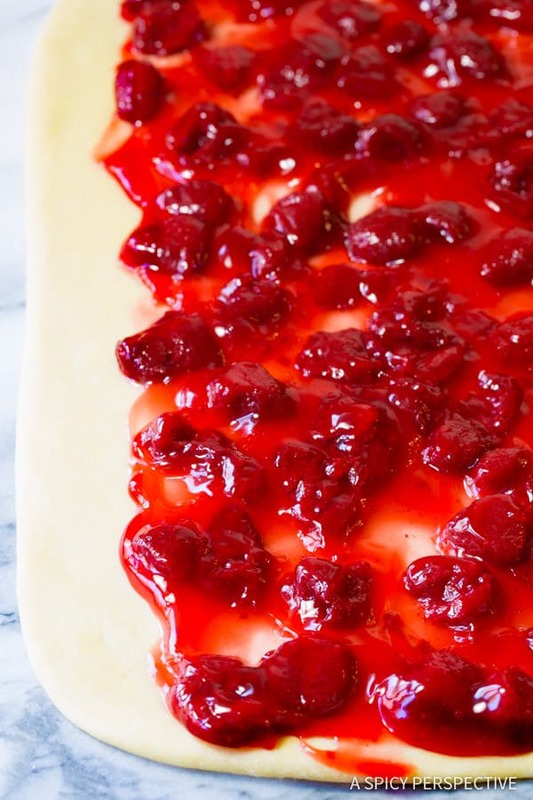 Spread the berries over the dough as directed above and continue following the recipe as-is. Can these be made the night before but cooked in the morning? Yes, just cover the pan tightly and refrigerate. This may add 10+ minutes to the bake time. Pingback: 23 Strawberry Desserts Just in Time for Summer! These look like a gorgeous painting, Sommer! 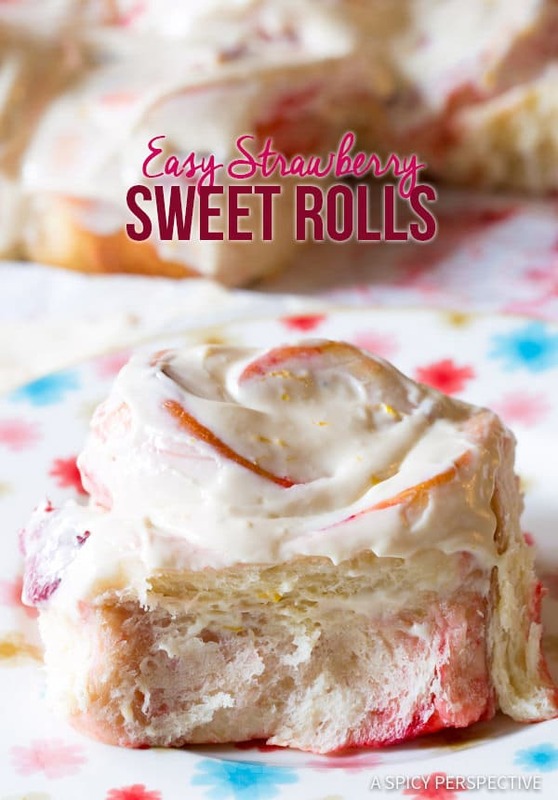 I’ve never made strawberry rolls (usually stick to a cinnamon/ nutmeg variation)- now they’re on top of my list. Thanks for the inspiration! 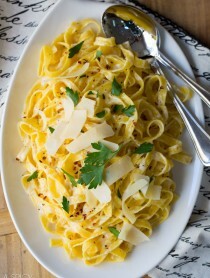 I don’t normally leave comments on recipes, but these were that good! I made a couple of adjustments: I used a different pie filling, kneaded the dough traditionally, didn’t use a roll sheet, and doubled the glaze amount. It worked really well, but I did have to bake them longer–about 30 minutes. 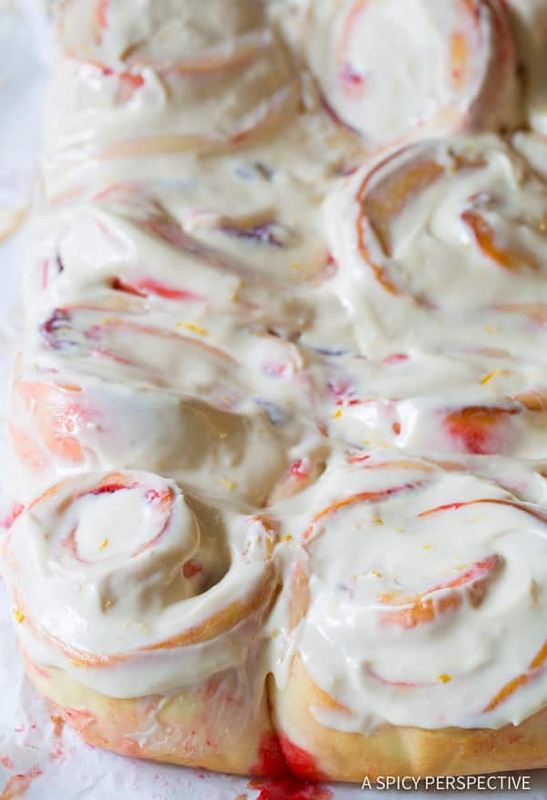 Beauties, and that lemon glaze sounds divine! Is it too far to say I want to sing songs about these rolls?! Because they just make me so happy!! They look so gooey and delicious! Um, move over cinnamon rolls there’s a new flavor in town! Love! These are so beautiful and could easily be adapted to include blueberries or blackberries. Spring, here we come! these look amazing! Happy Monday!